Today is my Mom’s birthday. I’m very lucky to have such a wonderful woman as my mother and my friend. And although I may not always show it I do appreciate everything she’s done for me. To celebrate her special day I made a deliciously moist Bundt cake. 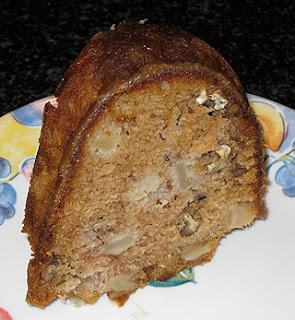 It is studded with pears & chopped pecans and topped with caramel. I found the recipe in the Southern Living Farmer’s Market Cookbook and it was perfect for the occasion. Preheat oven to 350 degrees. Butter and flour a 10 cup Bundt pan. Toss pears with 1 tablespoon sugar and let stand. Beat eggs, 2 cups sugar, and oil at medium speed in an electric mixer until blended. Combine flour, salt and baking soda. Add to egg mixture a cup at a time on low speed until blended. Fold in pears, pecans and vanilla extract. Bake about 1 hour, until toothpick comes out clean. Let cool in pan for 10 minutes and then turn onto serving plate. Prepare Caramel Glaze buy stirring together the brown sugar, butter and evaporated milk in a saucepan over medium heat. Stir constantly, bring to a boil and cook 2 minutes until sugar is completely dissolved. Let cool slightly to thicken. Spoon glaze over cake. Serve extra sauce immediately with warm cake. In honor of my mom and mom's everywhere I've decided to do a cookbook giveaway. One lucky reader will have the chance to win a copy of Cookinglight's Complete Meals in Minutes. This book is a great resource for anyone trying to make delicious and healthy meals in less than 30 minutes. It's loaded with photos and comes in binder format which makes it easy to locate recipes by topic. How to win: We're going to keep it simple just leave a comment on this post by midnight (EST) Monday 11/8 and you will be entered. I just printed this up and I am debating, whether, I should make it tonight for my hubby. This is so him. This is a great giveaway. I was looking, the other day, and debated buying it, since I love Cooking Light but I put it off. Make it tonight...he'll love it. A nice addition to this recipe is to add a little cinnamon to the batter. Now this sounds and looks fabulous! I love the different textures in it, too. Happy Birthday to your mom! What a wonderful way to celebrate her special day. Anything with caramel and pears makes me smile! I'm sure your mom is an amazing woman. Great looking cake. Thanks for the giveaway. Looks wonderful! Enjoy your special day with your mom. We just recently moved 2500 miles across the country to live closer to my mom. Family dinner is my priority each day. I love a great home cooked meal with the people I love. Aww happy birthday to your mom! What a sweet thing for you to do! That cake looks fantastic! That pear cake sounds fantastic. I'd love to try this recipe. Am I too late? I'd love to win this! And Happy Birthday Food Hunter's Mom!!! MMMMmmmmm, this cake makes my mouth water. I can't wait to make it!!! Thank you for the recipe!!! I'm in love with this delicious pear cake! The caramel topping rocks!